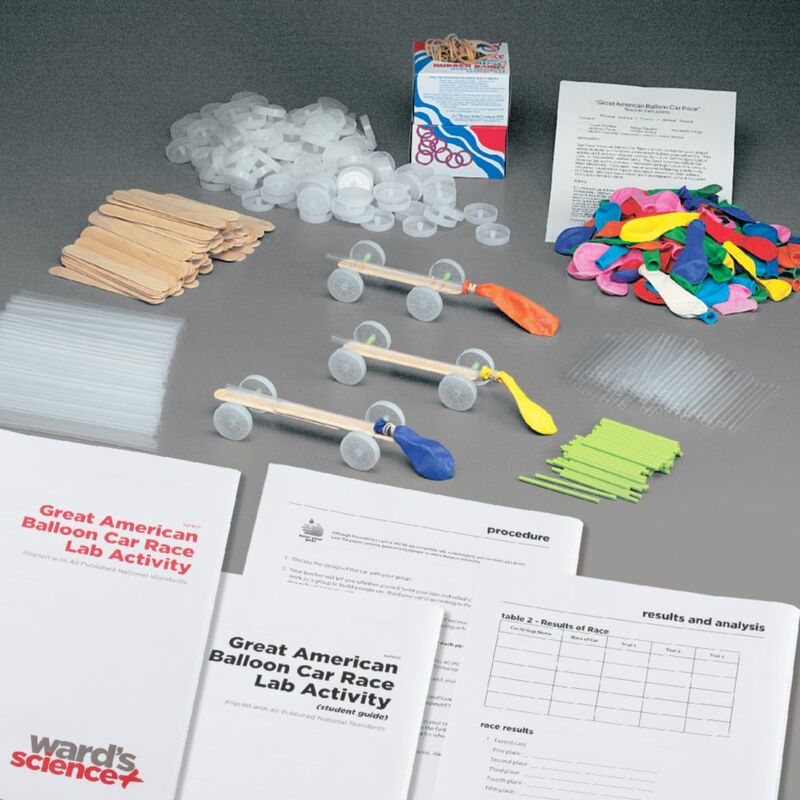 The Great American Balloon Car Race Race is a high interest, hands-on project that allows students to easily design, build, and race lightweight "gas" -powered vehicles. The gas source, of course, is the air in the balloons. The students' understanding of these activities will allow them to look into and learn about simple machines, motion, force, energy transfer, mechanical energy, and problem solving. In doing this, students will employ framework concepts from physical science as well as engineering, technology and applications of science (PS2-Motion and Stability: Forces and Interactions, PS3-Energy and ETS1 - Engineering Design). This kit has been aligned with all published National Standards. Pre- and Post-laboratory assessments and vocabulary words all target specific Science and Engineering Practices and common core standards. The teacher guide also contains specific "Did You Know" concepts that link the real world with the scientific standards explored. A student copy master is also included. 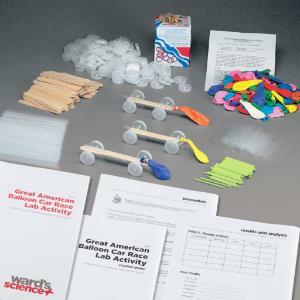 This kit includes enough materials to build 40 balloon cars. Time requirements: This activity can generally be completed in two 45-minute class periods or over several class periods. First class period: Building Balloon Race Car. Second class period: Testing/Racing Balloon Race Car. Ordering information: Kit includes 80 Axles (green), 160 Wheels, 1 Package, rubber bands, 2 Packages, 50 straws, 3 Packages, 35 balloons, 100 Tongue depressors, and Teacher's Guide and Student Guide. Materials not included are Balance, trundle wheel, masking tape, chalk, ramps, meter sticks, stopwatches, protractors, rulers, scissors, glue, markers, stickers, and other decorative materials. Caution: WARNING: CHOKING HAZARD–Children under 8 yrs. can choke or suffocate on uninflated or broken balloons. Adult supervision required. Keep uninflated balloons from children.